The University of Nottingham Malaysia is a franchised branch campus of the University of Nottingham majority owned by Boustead Holdings Sdn Bhd. The university is situated in Semenyih, Hulu Langat District, Selangor, Malaysia. The university has been ranked as "excellent" or tier 5 in a scale of tier 1-6 and is classified as a private institution, by the Malaysian Ministry of Higher Education. The campus is run as a company The University of Nottingham Malaysia Sdn Bhd (473520-K) with the provost being dual hatted as the CEO. The majority shareholder is Boustead Holdings. The Malaysia campus was the first campus of a British university in Malaysia and one of the first to open outside Britain thus earning the distinction of the Queen's Awards for Enterprise 2001 and the Queen's Award for Industry (International Trade) 2006. The University of Nottingham's other overseas campus is in Ningbo, China. The Malaysia campus was established in 2000 when the first batch of students were enrolled, students were then taught in a rented building. The idea for the university to open a foreign branch was suggested as early as 1992. It is the first purpose-built UK university campus in a foreign country. Formerly, the university was known as the University of Nottingham in Malaysia or UNMC. The campus' incumbent chairman is Ahmad Rithauddeen, an honorary Nottingham graduate and former Malaysian Defence Minister. The present campus at Semenyih was officially opened by then Deputy Prime Minister Najib Tun Razak, an alumnus himself, on 26 September 2005. The campus was made possible by a consortium of partners which includes the Lembaga Tabung Angkatan Tentera or Armed Forces Fund Board (LTAT) via its subsidiary Boustead Holdings Bhd, YTL Corporation Bhd and the University of Nottingham and the Alumni Association. The University operates as a private company called The University of Nottingham in Malaysia Sdn Bhd. where Boustead Holdings Bhd has the majority shareholding. Prior to the opening of the main campus in Semenyih, the university operated at the former Majestic Hotel building near Kuala Lumpur Railway Station and at Wisma MISC or MISC Tower. Following the opening of the Semenyih campus, most of the teaching departments were moved to Semenyih, only certain post graduate courses still remain in Kuala Lumpur. In 2007 the campus reopened a Kuala Lumpur branch in Chulan Tower on Jalan Conlay. 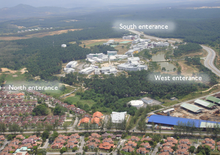 The Malaysia campus is primarily based on a 125-acre (0.51 km2) plot situated in Semenyih, Selangor. The campus is equipped with student recreational facilities such as a sports complex which houses an outdoor 25m swimming pool, two tennis courts, squash courts, six basketball courts, a multi purpose hall, a 60m² gym, hockey/futsal field, a frisbee court, a dodgeball arena and a football field. A students association building forms the connection between on-campus housing and the teaching buildings. Besides the main campus in Semenyih, a city teaching facility is maintained in Chulan Tower in Kuala Lumpur's central business district. Postgraduate programmes, such as applied psychology, business and management, are taught at the KL Teaching Centre. Being a branch campus of the University of Nottingham, students are not necessarily taught with similar course materials and generally do not sit the same exam papers as those in the UK, but are still under the jurisdiction of the Quality Assurance Agency for Higher Education (QAA). Upon completing a degree at the Malaysia campus, students are awarded a University of Nottingham degree certificate at a convocation held locally which is indistinguishable from the certificates awarded at the Nottingham campus. The degrees that are awarded are accredited by international professional bodies such as the Association of MBAs and the UK Engineering Council. The Engineering Degree courses are accredited by the Board of Engineering Malaysia (BEM) and the Malaysian Qualifications Agency (MQA). Students at this campus are required to pass additional courses that are not required by UK students. These courses include Malay Language and Asian Civilisation. The university's career office and the Wall Street Society co-organized numerous company talks and at least one career fair each year. The career office also organised workshops to teach students how to present themselves during interviews, how to write a winning CV etc. Many of its graduates join some of the most prestigious companies located in Kuala Lumpur, such as Shell, Petronas, CIMB, MayBank, Affin Investment Bank, Securities Commission, Accenture, Roland Berger, Boston Consulting Group, Nestle and P&G. Apart from the taught undergraduate and postgraduate programmes, the university conducts projects for research-based postgraduate studies. There are more than 20 research programmes being carried out at the Malaysia Campus. The Sahz-UNMC Pilot Plant is a small prototype manufacturing plant built inside the engineering faculty building (D-Building) occupying a space of no greater than 25 square metres (270 sq ft). Research is focused towards mass fabricating supercapacitors. Funding for this project is granted from a RM6.5 million Technofund grant by the Ministry of Science, Technology & Innovation (MOSTI). The research project also has links with SEMYUNG Ever Energy Co. Ltd. (South Korea) and 2M Engineering Ltd. (Netherlands). The Biotechnology Research Centre is a 986-square-metre (10,610 sq ft) research centre specialising in the applied research of biotechnology products, specifically palm oil crop. The building cost RM3.5M, excluding internal fittings and scientific equipment. Inside the main research building there are two labs, one for the teaching of UNMC biotechnology students and the other for research. The research centre is operated as a joint collaboration with Applied Agricultural Resources Sdn. Bhd (AAR), a start-up company. During the design and planning phase of the Semenyih campus, there were issues that a planned incinerator was to be built in Broga, something which the university and local area residents protested about. Eventually, the incinerator plant was reportedly moved to a new site in Kampung Bohol, Puchong. The University of Nottingham Rugby Club Nottingham Knights were champions at the 2011 Malaysia Association of Private Colleges and Universities (MAPCU) Rugby tournament. The team beat all opposition without conceding a goal. The Malaysia campus played host to the Nottingham Tricampus games in the summer of 2010. It will play host again in the summer of 2013. Priority for on-campus residence is allocated to international students and first year freshmen, while senior students generally stay off-campus in the nearby neighbourhood of Taman Tasik Semenyih. Although there are plans to further increase the number of on campus student accommodation, the university is focused on expanding off-campus housing. On-campus housing is made up of five residential halls - Pangkor Hall, Redang Hall, Tioman Hall, Kapas Hall and Langkawi Hall, which are named after resort islands in Malaysia. Private accommodation is also available directly opposite the main entrance to the campus called UniVillage. IGNITE Magazine is the official student media in the Malaysia campus. It is an online media platform founded by Ben Hunte and Eiman Mirghani. The magazine is now supported by the University's School of Modern Languages and Culture. The online magazine is open to the existing student population and provides coverage of both on and off campus events. As part of Nottingham's advantage scheme, students may be exchanged to other campuses. In the words of Vincenzo Raimo, director of Nottingham’s International Office “Students can continue studying exactly the same modules available at Nottingham in the UK but overseas instead — experience the excitement of Asia but within the familiar academic setting of Nottingham University, ... Transfers are open to anyone getting good grades and whose degree subject is among those taught overseas. Air fares may not be cheap, but the cost of living is — and anyone spending the full year at a branch pays just half the UK tuition fee. " These exchanges are not guaranteed but subject to agreement by the exchange partners at the time. The university provides a free university shuttle bus commuting between the campus and Kajang railway station. Shuttle bus services are offered free as a university incentive to provide greener sustainable transport and to alleviate on-campus parking issues. However, shuttle bus services are by regulations restricted to students and staff of the university. The nearest public bus route is at the nearest town of Semenyih, approximately 3 km from campus. The university provides free transportation to the nearby Tesco super store and IOI City Mall which located in Putrajaya, special bus service to the Semenyih mosque for Friday prayers, and a shuttle bus service for students living in the student town of Taman Tasik Semenyih or Semenyih Lake park. A pedestrian bridge connects the neighbouring Taman Tasik Semenyih to the North entrance. ^ "Staff Listing – The University of Nottingham". Nottingham.ac.uk. Retrieved 2 January 2011. ^ "From the Provost Office". nottingham.edu.my. Retrieved 31 August 2016. ^ a b c "Student population 2015/2016 - The University of Nottingham". Nottingham.ac.uk. Retrieved 26 June 2016. ^ "THE 2009 RATING OF MALAYSIAN UNIVERSITIES AND UNIVERSITY COLLEGES" (PDF). Rating System for Malaysian Institutions of Higher learning. Ministry of Higher Education Malaysia. Retrieved 29 March 2011. ^ "Malaysia Campus - The University of Nottingham". Nottingham.ac.uk. The University of Nottingham. Archived from the original on 22 September 2009. Retrieved 2 January 2011. ^ "It's in the bag ... Firms and uni win recognition from Queen". TMCNet. Northcliffe Newspapers Limited. Retrieved 31 March 2011. ^ Baker, R. "Nottingham Evening Post Business Awards: Our Sponsors". This is Nottingham. Nottingham Post. Retrieved 31 March 2011. ^ a b Theophilus, Claudia (29 January 1999). "Move to limit foreign university branch campuses to prevent competition". Malaysiakini.com. Retrieved 13 September 2011. ^ "Non-academic facilities". University Of Nottingham Malaysia Campus. ^ "About the University,Malaysia Campus". University of Nottingham Malaysia Campus. ^ a b Gosden, Emily (3 June 2009). "Good University Guide 2010: Studying overseas". The Times. Retrieved 31 March 2011. ^ "Research - The University of Nottingham - Malaysia Campus". www.nottingham.edu.my. Retrieved 25 May 2018. ^ "Postgraduate study - The University of Nottingham - Malaysia Campus". www.nottingham.edu.my. Retrieved 25 May 2018. ^ News, The PIE. "Global events mark int'l impact of University of Nottingham Malaysia". thepienews.com. Retrieved 25 May 2018. ^ "Zero-waste palm oil industry on the horizon with new technology". Retrieved 25 May 2018. ^ a b Dr. Wong Wei Chi. "Opening of Applied Agricultural Research Research Centre". Applied Agricultural Research. Applied Agricultural Research. Retrieved 11 April 2011. ^ Dr. Sandy Hwei San Loh. "The AAR - UNMC Biotechnology Research Centre". Nottingham Website. Nottingham University. Retrieved 11 April 2011. ^ Kang, Soo Chen. "Right on track". Star Online. The Star. Retrieved 11 April 2011. ^ Theophilus, Claudia. "British U's local campus project in limbo due to incinerator". Malaysiakini.com. Retrieved 13 September 2011. ^ "University of Nottingham Rugby Club Wins Tournament". University of Nottingham Malaysia Campus Website. Retrieved 21 May 2011. ^ "The Malaysia Campus". Impact Magazine. The University of Nottingham. Retrieved 31 March 2011. ^ "SHUTTLE BUS / VAN SCHEDULE" (PDF). University of Nottingham Malaysia Campus. 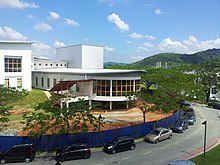 Wikimedia Commons has media related to University of Nottingham Malaysia Campus.